Citations can be imported into FACULTY180 in RIS or BibTeX format. For example, citations can be exported from Google Scholar in BibTeX format and then imported into FACULTY180. Once the citations have been exported, log in to FACULTY180 and follow the steps below. FACULTY180 has a very sophisticated algorithm to compare the fields of the imported Scholarly Contributions and Creative Productions with current activities in the database, and then clearly shows the faculty member which activities it flagged as possible duplicates. After you have logged into Google Scholar, you can easily export your citations to then import it to Faculty180. Click the Activities link in the menu. Click the Action item in the To Do section, if the link is displayed there. Click the Activities link in the Manage Your Data section. The Activities form displays. If the Scholarly Activities section is not already open, scroll down to the section and click the expand icon to expand the section. The Activity Input screen displays. Click the Generic (RIS / BibTeX) import option. Note: Click the Help Videos link to view tutorials on importing citations into FACULTY180. Select the citation format BibTeX. Click Choose File and browse to the location of the saved citations. Select the citation file. The citations from the file are listed. Select the citations to import. The check box in the heading row can be used to select or unselect all citations. After reviewing all of the relevant information, click Import Selected. Review the results of the Imported Activity Counts. If enabled, FACULTY180 will flag any possible duplicates. FACULTY180 has a de-duplicator (if enabled) that can weed out any duplicates of scholarly contributions within the database. The % Match displays the score related to the likelihood the record is a duplicate. Exact duplicates will be discarded. Click the View icon to show the details of the analysis (proceed to Step 16). Select the appropriate Action from the drop-down and proceed to Step 19. Click Cancel to address the possible duplicates at a later time. This will place a To Do" item on the dashboard. Refer to Step 20. 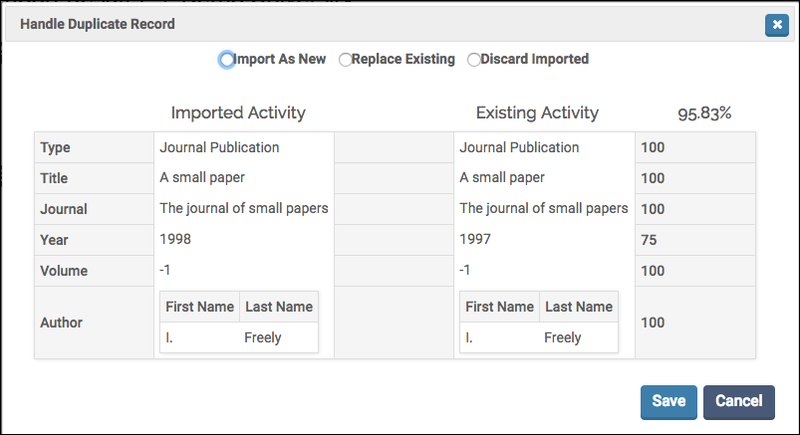 Import As New: If the imported citation is not a duplicate, select Import as New. Replace Existing: Select Replace Existing to have the newly imported activity replace the existing activity. Discard Imported: Select Discard Imported if the newly imported activity is a duplicate and should be deleted. Save: Save the data and stay on the page. Save and Go Back: Save and return to the previous screen. Cancel: Leave the page without saving the changes.